I was thinking on Wednesday that nothing weird had happened for a few days. ‘How will I update my blog?’ I thought, despairing. Fortunately, the fine patrons of our lovely public library never fail me, and this week they DELIVERED. Speaking of retiring, we had a really nice party for GY on Wednesday, who has retired after 22 years of service at the Alachua County Library Headquarters Branch. She got a sweet plaque, a lovely plant, and a nice card signed by all of us in Circulation. Her family came to the party, and some other friends who had retired already or moved to another branch. She was really happy, and when asked what she planned to do on Thursday, she said SLEEP, then READ. Good luck and enjoy retirement, GY! Also on Wednesday, my dad came to visit! He was in town for a meeting (he works for DCF in Jacksonville) and stopped by the library afterward. He wandered around for a bit before I was able to see him, then I took him downstairs to our work area, since I had phone duty and couldn’t leave. His comment about coming to the our work space was “I’ve never been inside the guts of a library before!” I told him it was pretty much like every other office! (Of course I didn’t show him the secret room where we conduct our black library magic rituals. He’s not an initiate.) We got to chat for a bit while I trapped holds and he told me he’s going on a trip to Brooklyn in a few weeks to talk about setting up a partnership between their library and social services department like we have here in Gainesville. Apparently some of our Library Partnership Branch staff is going to be there too, and the branch be used as a model! Our Partnership branch is award-winning, and combines the services of a library with the Partnership for Strong Families, which helps families sign up for food stamps and WIC, claim unemployment weeks, and other services for those in need. He could not stop singing the praises of our library, which always makes me feel good. 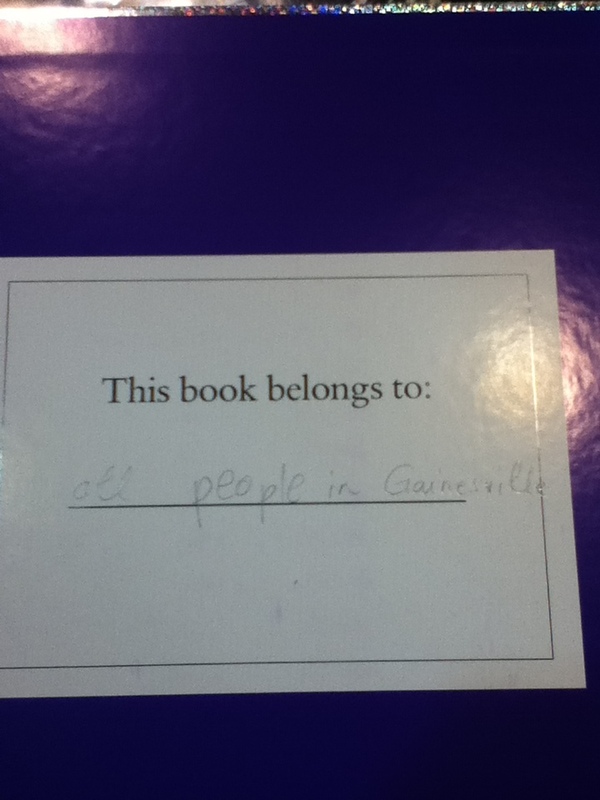 Libraries are awesome! Weird, but Funny: On Friday, we got a DVD in at the desk, and when AC and I looked at the back, we discovered that someone had added notes to it. 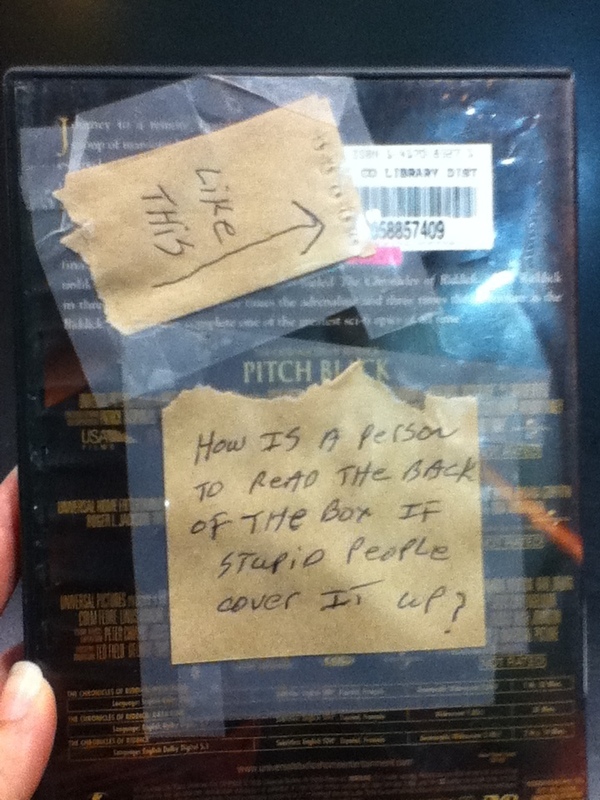 One said “How is a person to read the back of the box if stupid people cover it up?” Another, smaller note above it said “Like this” with an arrow pointing to our barcode, which was covering up part of the DVD description. Not only were these notes taped on, but they were taped to the INSIDE of the plastic covering. As I said to AC, people are never as industrious as when they are being passive-aggressive! I also had an interview on Friday for a Library Specialist position in the Adult Services department! It pays a little more and means that I would be working at the reference desk and doing programs instead of in Circulation. I should find out in a couple weeks if I got the job! Fingers crossed!